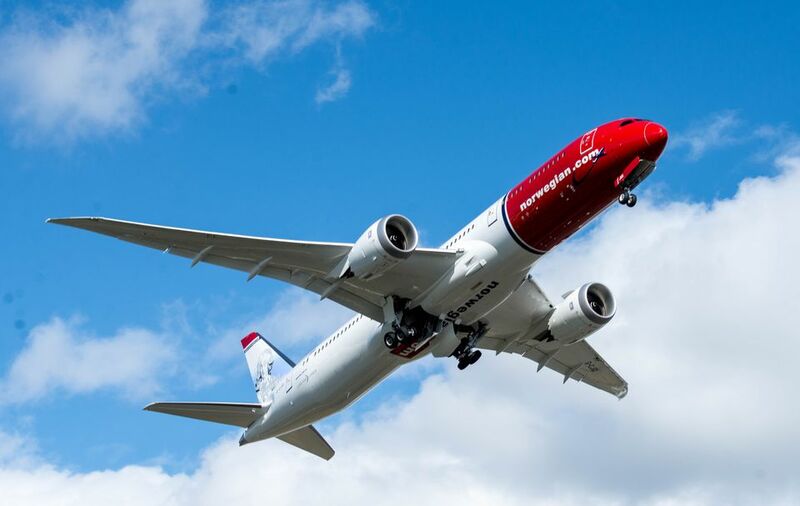 Norwegian Launches Rock-Bottom International Fares from the U.S.
International low-cost carrier Norwegian will begin offering 10 new trans-Atlantic flights from three U.S. airports with fares starting as low as $65 one way, including taxes. Travelers near New York’s Stewart International Airport, T.F. Green Airport in Providence, R.I., and Bradley International Airport in Hartford, Conn., will be able to fly Norwegian’s Boeing 737 MAX service to Ireland, Northern Ireland and the UK starting on June 15. Norwegian will fly from Providence to Belfast, Cork, Shannon and Dublin, Ireland, along with Edinburgh, Scotland. From Stewart, it will fly to Belfast, Dublin, Edinburgh and Shannon. And Bradley Airport will offer a flight to Edinburgh. The $65 fares will last until there are none left, said Lars Sande, Norwegian’s senior vice president of sales. “We worked with governments on both sides of the Atlantic to ensure we had a proper number of tickets,” he said, noting that “a few thousand” will be available starting today. The next fare will be $99 one way, also including taxes, said Sande. “After that, government taxes will be higher, so fares might also be a bit higher,” he said. Passengers can save by bundling a seat reservation, pre-ordering a meal service (including alcoholic beverages) and pre-paying for checked bags. The airline does not charge customers for carry-ons. Norwegian is able to offer these ultra-low international fares for several reasons, said Sande. “The most important thing is that we use the newest equipment. The average age of our fleet of 170 aircraft is 3.5 years,” he said. “You also need to have a lean organization. We have all this in place so we can offer the lowest fares. Year-round service to Edinburgh from Stewart International Airport will operate daily beginning June 15 for the summer season, and three times a week during the winter season; from Providence, flights will operate four times a week starting June 16 and three times a week during the winter season; from Hartford, flights will operate thrice weekly beginning June 17, and twice weekly during the winter season. Service to Belfast from Stewart will be offered three times a week during summer and twice a week during winter as of July 1; twice weekly from Providence as of July 2 during summer. Service to Dublin from Stewart starts on July 1 with daily flights during the summer and three times a week during the winter season; Providence will have five weekly flights that start on July 2 during the summer and three times a week during winter. Flights between Shannon and Stewart begin on July 2 with twice-weekly flights and from Providence on July 3 with twice-weekly flights. And year-round service to Cork from Providence will start on July 1 with three weekly flights during summer and a twice-weekly service during the winter season. Norwegian chose Stewart, Bradley and TF Green airports because the airline has a legacy of flying not only in and out of the hubs of legacy carriers, but also to smaller airports, said Sande. “There are those who don’t want to fly out of JFK ​or Boston Logan to Europe. These cities allow us to offer direct flights on the 737 MAX,” he said. Sande noted that Norwegian also gets more cooperation with smaller airports. “We get more attention from these airports, and we feel there will be more seamless and easier travel for passengers,” he said. “At JFK we’re just a small airline and many won’t notice that we are there. But at these airports, we get lots of attention from the local media and the catchment area.” People will be willing to drive to these airports to get access to these low fares, he added. Right now, Norwegian only operates in Edinburgh and Dublin, said Sande. “Belfast, Shannon and Cork are new cities,” he said. Including these new routes, Norwegian now offers 55 routes from the U.S., 48 to Europe and seven to the French Caribbean. Other new flights coming in 2017 include: Oakland/San Francisco to Copenhagen (March 28); Los Angeles to Barcelona (June 5); New York/Newark to Barcelona (June 6); Oakland/San Francisco to Barcelona (June 7); Orlando to Paris (July 31); and Fort Lauderdale to Barcelona (August 22).